A motorcycle fan, Chevrier studied mechanical engineering at the Ecole Nationale d'Ingenieurs at Metz (ENIM) before starting work in motorcycle racing with the French Motobecane concern (which was taken over by Yamaha in 1986) in 1980. In the start of 1985 he joined Bernard Dudot's engineering team at Renault Sport, working as an engineer with Tyrrell during the 1985 and 1986 seasons and then switching to the World Rally Championship in 1987 engineering a Renault 11 Turbo. After that program ended he was transferred to the Renault prototype department but in 1989 was recalled to Renault Sport to work as an engineer with the Williams team. He worked initially with Thierry Boutsen but then went on to oversee the engines used by Nigel Mansell and Alain Prost. In 1994 he worked with Damon Hill and then Jacques Villeneuve. When Renault Sport withdrew from F1 again at the end of 1997 Chevrier was seconded to Mecachrome and in 1999 joined the Supertec operation, although he remained under contract to Renault Sport and returned to the firm when it returned to F1 in 2001. 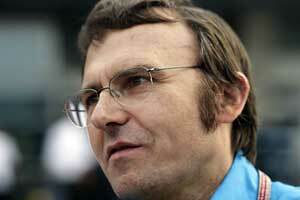 In 2002 he was appointed operations manager for Renault Sport in France.